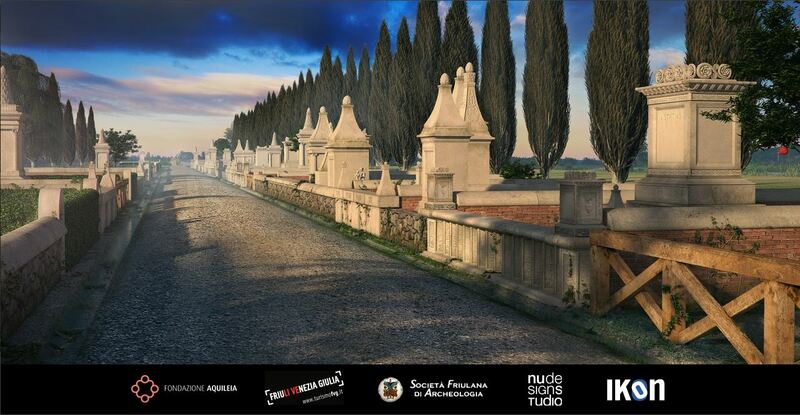 The only portion of a necropolis now visible in Aquileia consists of five burial plots alongside a secondary road leading outside the city. The enclosed plots, all equal in width but different in length, belonged to five families from Aquileia (Statii, anonymous, Julii, Trebii, Cestii). The extant monuments and the tombs underneath, excavated in 1940-1941, tell that the plots were used starting from the 1st century AD. The fourth burial monument was used until at least the 4th-5th centuries AD, as witnessed by a number of sarcophagi dating from the late Antiquity, some of which are now displayed on small brick pillars to help identify the level where they were found. Recently, archaeologists uncovered new cremation and inhumation graves that had been overlooked during earlier excavations. The funerary monuments have been recently cleaned (2015-2016) and will be soon provided with a lighting system.